, a celebrated controversialist on the side of the papists, was born at Henfield, in Sussex, in 1535, of a genteel family from Yorkshire. Having been educated at Canterbury and Winchester, he was removed to New college, Oxford, where he obtained a perpetual fellowship in 1554. In the same reign, which was that of Mary, he was made prebendary of Chichester; but on the accession of Elizabeth, left the kingdom, vith his father and other relations, and settled at Louvain, where he distinguished himself by his controversial writings against Jewel, Home, Whitaker, and other eminent divines of the English church. 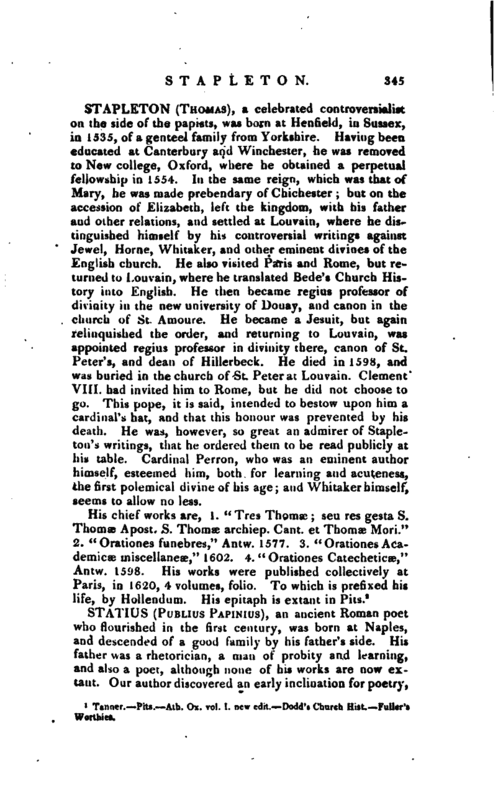 He also visited Paris and Rome, but returned to Louvain, where he translated Bede’s Church History into English. He then became regius professor of divinity in the new university of Douay, and canon in the church of St. Amoiue. He became a Jesuit, but again relinquished the order, and returning to Louvain, was appointed regius professor in divinity there, canon of St. Peter’s, and dean of Hillerbeck. He died in 1598, and was buried in the church of St. Peter at Louvain. Clement VIII. had invited him to Rome, but he did not choose to go. This pope, it is said, intended to bestow upon him a cardinal’s hat, and that this honour was prevented by his death. He was, however, so great an admirer of Stapleton’s writings, that he ordered them to be read publicly at his table. Cardinal Perron, who was an eminent author himself, esteemed him, both for learning and acuteness, the first polemical divine of his age; and Whitaker himself, seems to allow no less. Tanner. Pits. —Ath. Ox. vol. I. new edit. Dodd’s Church Hist. Fuller’s Worthies.